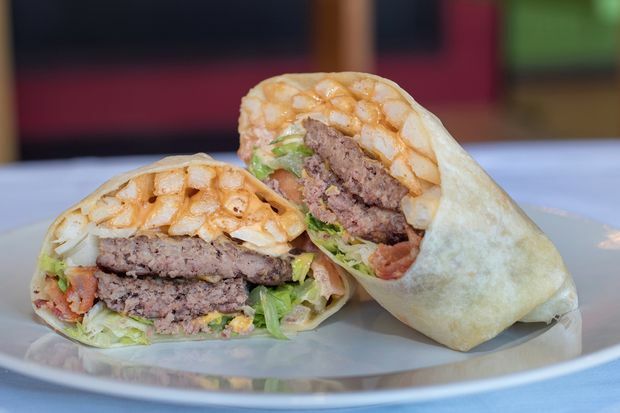 The Burgrito is the star attraction on the menu at Burgrito's, a Long Island restaurant that serves burgers and Mexican food. It's opening on the border of Park Slope and Gowanus early in 2017. PARK SLOPE — It's either an unholy alliance or a match made in heaven. A hamburger and burrito mashup is coming soon to Brooklyn. Burgrito's will serve a chopped up bacon cheeseburger and French fries drizzled in chipotle sauce and swaddled in a tortilla. But does it taste more like a burger or a burrito? "It takes like a burgrito," co-owner Darin Laby said. "It has its own unique flavor. When you eat a burger on a bun, you get a lot of bun, when you have a burrito, you get a lot of rice and beans. "[The burgrito] is really the best of both worlds. You get the veggies and sauce that you get with a burrito, but then you have French fries. And it's big. People love that. It's a very satisfying item." The first NYC location of Burgrito's will open at 173 Fourth Ave. and Degraw Street, a space previously occupied by Zuzu Ramen. The restaurant will have 20 to 25 seats and will serve lunch and dinner from roughly 11 a.m. to 10 or 11 p.m., said Darin Laby. He and his brother, Lawrence Laby, bought the first Burgrito's in Bethpage from its original owner in 2014. The menu has two distinct sections: burgers and fries on one side and standard Mexican fare on the other. The two cuisines meet and mingle in the burgrito, which is by far the biggest selling item on the menu, said Darin Laby. The brothers are renovating the space and plan to open early next year. The Labys worked at their family's moving and trucking business for more than a decade, then decided to try their hand at hospitality. Burgrito's is their first restaurant. The two have no cooking experience and Lawrence is a vegan, which means he's never tasted the burgrito, though there are some vegan items elsewhere on the menu. When the brothers were looking for a restaurant to buy, Darin Laby acted as the primary food tester for the duo. "There’s a lot of trust," said Darin Laby, describing the tasting process. "Lawrence is like, 'Darin, is it good?.' I'm like, 'Yes, this is good.' I had the burgrito and right away I knew. I was like, ‘This is awesome. We could take this really far.'"